PARIS -- Renault will offer a 500-euro satellite navigation system on its Clio small car. The system is part of Renault's "navigation for all" project, which aims to make satellite navigation devices accessible to all car buyers by dropping the price to below the usual 1,200-2,000 euro price range for satnav systems. The system will quickly be extended from the Clio across Renault's range starting with the lower-medium Megane line, said Patrick Vergelas, project director of Renault's Transversal Carline project. 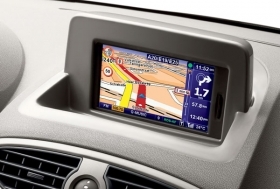 Renault developed the system with TomTom, a Dutch-based maker of car navigation systems. The carmaker does not expect the device to compete with its more expensive Carminat system, which is offered on higher-priced vehicles. Instead, it sees the TomTom system as a "complement," Vergelas said. Renault will launch the TomTom system on its face-lifted Clio, which will debut at the Geneva auto show next month. The system will be available from the Clio's launch in most European countries, as well as Turkey and South Africa, according to Giles Shrimpton, TomTom's head of automotive.